Today marks the anniversary of the enthronement of King William III and Queen Mary II following the Dutch invasion led by William of Orange, since called the "Glorious Revolution" which deposed the lawful monarch, his father-in-law, King James VII of Scotland and II of England. Of course, it was not as bad as most revolutions in that the British monarchy was not abolished altogether but it certainly saw its weakening and was a major triumph for the same faction that had murdered King Charles I and so hindered and harassed King Charles II; that is, the faction which wanted the absolute power in the country to be Parliament rather than the Crown. They had never really been defeated on the battlefield and so, even when forced to agree to the recall of Charles II, they never considered themselves beaten and still acted like the masters of the Crown. It was this spirit which caused them to so bedevil Charles II on the subject of the succession. Of course, Charles II would have none of their intereference and insisted that the succession was in the hands of God alone and no one on earth could tamper with it. Because of that, James II became King after him and the Parliament plotted his overthrow and replacement by a pock-marked, asthmatic, hunchbacked Dutch republican simply on the grounds that he was a Protestant and would be content to let Parliament rule the British Isles so long as it served the interests of the United Provinces in their war against the Kingdom of France. 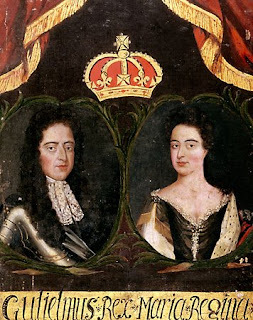 The "Glorious Revolution" and the eventual coronation of William III and Mary II set another dangerous precedent and it is hard for me to determine how any monarchist can regard the affair as a totally good thing. Putting aside, for a moment, the villainy of treason against the legitimate, lawful monarch, what about the treason of a daughter against her father? For children to honor their parents is a Biblican command -not a suggestion. Since that time Parliament has been the power in the British Isles (in fact if not name) and they know it and every monarch that has sat on the throne since have known it. Things might have been different had events at the Boyne or Culloden gone differently but it was not to be. The Stuarts were gone and the Oranges, later the Hanoverians, were the new Royal Family. Given the recent speculation over the possible amendment of the Act of Settlement, and all the uproar over that, I find it humorously ironic that it is the monarchists of the proud, Protestant Orange camp who most object to any change in the succession, to lifting the ban on Catholic marriages and to any changes that might effect the succession in the future. I wonder if they are aware that it was their own ideological forefathers who set the precedent of Parliament having control of the succession in the first place?